GN mud system is composed of 4 phase mud treatment equipment & mud tanks, including auxiliary equipment, like mud agitator, mud gun, mud hopper etc. Recently, we have one client from Middle East who need to buy 2 sets of mud system for the water well drilling rigs. As the water well will be drilled to 1000m to 1500m depth, we recommend complete mud system with 4 phase mud separation equipment. 4 panel shale shaker with composite material shaker screen. The shaker screen is equivalent to Swaco Mongoose. 4 panel shale shaker with longer shaker deck, the separation performance of the drilling mud will be much better than 2 panel or 3 panel shale shaker. Some client may have large quantity shaker screen stock for King cobra shaker, we can customize proper size shale shaker to meet the requirement. 4 panel mud cleaner, with 4 panel shale shaker & 1ea desander cyclones & 8ea desilter cyclones. 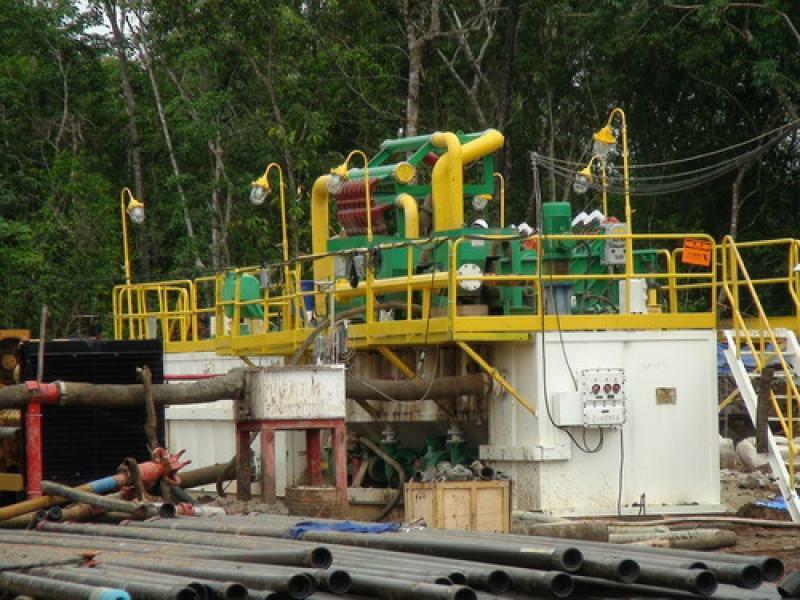 Removable hydrocyclone assembly for adjust to be a shale shaker. Patent shaker deck angle adjustable while working, mechanical deck angle adjustment with reliable performance. The mud tank is same size to 40ft container with container locking port and lifting pad eyes. The mud tank also equipped with 1ea mud agitator in the 3rd compartment of the clean mud, and one mud hopper with one centrifugal pump is installed on the skid of the mud tank to mixing chemicals. If you need more information of GN mud system for water well drilling, pls contact us freely. Recently, we have clients from Middle East, who are keen to buy two sets oily sludge treatment system from GN. The waste sludge is from oil refinery and they have clear research on the material and clear target. 1) Oil sludge washing tank. The client put the oil sludge into this tank, add washing chemicals, to remove and separate the crude oil from the solids/sands. Mud agitator equipped on the tank to suspending and mixing the oily sludge. If necessary, hot water will also add into the washing tank to achieve better performance. 2) Centrifuge tank. After washing tank, the oily sludge will be feeding to centrifuge via screw pump. The decanter centrifuge can separate the solids in high efficient way. After that, the clean liquid part will go to next V type tank, and the solids can be collected by cuttings skip. 3) Flocculent unit, will provide chemicals to the second V type tank, and stick the fine solids again for further separation. 4) Oil water separator is also necessary part for the separation. After separation, the oil, water and solids can reach separate target, which is relatively clean enough for other application. 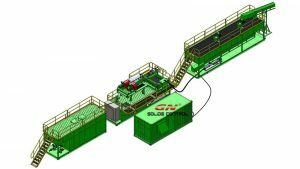 GN Solids Control as the first API certified solids control company from China. We already work in this field for almost 10 years. In the past years, GN became the China top brand based in China and USA. From 2007, GN begins the solids control company at Tangshan city, Hebei Province. From 2010, GN successfully achieves API certification, to be the first API certified China Solids Control Company. In 2011, GN begin a new company (Hebei GN Solids Control Co., Ltd) in Langfang City, Hebei Province. In 2012, GN moved to the new location in Langfang city, which is much closer to Beijing International Airport. In 2013, GN begin GN Solids America new company in Houston, USA. To become the first China & USA based solids control company. In 2014, GN begins the Russia brand in Moscow. Up to now, GN expand to own No.2 new facility close to Beijing. Mud agitator is actually a basic machine for drilling mud tank. It actually is utilised in mud tank to agitating fluids and keep clear of it from settling down. Per the style assortment, you’ll discover coupling sort agitator and direct connecting sort mud agitator. Per distinction Horsepower, you’ll discover agitator differ from 4hp to 30hp. Remarks Shaft and impeller is going to be offered by GN, but not such as within the weight & dimension. 1) Per tank dimension, usually 25cbm around there should be a mud agitator. two) Mud agitator shaft length depends on tank dimension. Which tank compartment should equipped mud agitator? GN Solids America not only product Mud agitator, but also product other solids control product, such as desilter,desander,mud cleaner,drilling waste management, ETC.